Rome attraction-guides.com - Rome, Italy attractions guide Rome Vatican City, Pope, History information about attractions, history, independent sovereign state, St. Peter's Basilica, Sistine Chapel, Sacred Grottoes, St. Mary Major, St. John in Lateran, St. Paul's Basilica, location and address, general tourist information about Vatican City in Rome (Roma) area, Italy (Italia) IT - Last updated 30/10/2012. The Vatican is much more than just a city, the Vatican is actually the world's smallest independent sovereign state, established by the Lateran Treaties in 1929. 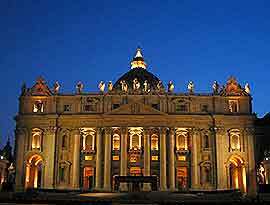 Ruled by the Pope, Rome's Vatican City covers an area of just 108 acres / 43 hectares. Close to the right bank of the River Tiber, the Vatican City contains its own civil and judicial systems, post office, bank, newspaper, radio station, supermarket and even a Vatican railway station. Often referred to as the Holy See, some of the most popular attractions in Rome's Vatican City include St. Peter's Basilica and the Sistine Chapel. Other popular tourist attractions within Rome's Vatican City the Sacred Grottoes, St. Mary Major, St. John in Lateran and St. Paul's Basilica, all of which contain a wealth of Rome history and many interesting displays.